Colcacchio Pizzeria is my favourite restaurant for a great pizza. 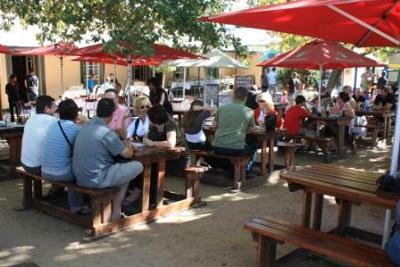 Although they have many outlets, my favourite is the one in Franschhoek. We usually have a similar routine when we go there. First we will go for a walk down the main street enjoying the sights and sounds. Having built up an appetite this way, we'll go for lunch under the oak trees. Service is very good and the waiters give attention to small detail. I enjoy their thin base pizzas and generous toppings and my favourite is the "prostituto" topped with bacon, spinach and feta. Hmmmm delicious! !